Realistic | Reading. Running. Knitting. So, my husband has been at me for the past couple days to organize our hats/mitts/gloves shelf in our closet, and because I’ve been reading financial blogs, and they keep on saying you should “declutter,” I decided to actually take a look at what I have in there. 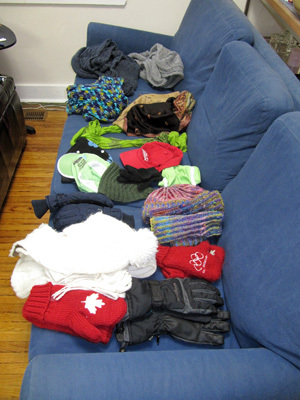 This is all the winter hats, mitts, and scarves my husband and I own. Actually my husband has a pair of earmuffs as well, but they went with him to work. Belonging to my husband are the Olympic mitts and the black gloves at the bottom of the page. Everything else is mine. I have 7 scarves, 7 hats, and 4 sets of mitts/gloves/hand warmers. And to make it worse? 5 of the hats are associated with running. FIVE!!! I think I have to get rid of two right now just to make myself feel like less of a glutton. Ok, down to 5 hats total. I think that’s a bit better. But the point of this is that I feel that I just have too much stuff. I don’t need any new pants or sweaters or shirts. I don’t need any new vases or appliances. If I get something new, I feel that I really need to be getting rid of something that I already have. I have a storage tub in the basement full of shirts that I haven’t worn since I moved here three years ago. Someone else might want them, because I haven’t missed not having them. But what do you do about items that you “can’t” give away? The extra appliances people get you for Christmas presents, or that ornamental clock that REALLY isn’t to your taste that you got at your wedding shower. Is it realistic to just keep on collecting things forever? For people to think that you’ll keep things forever? This entry was posted in Uncategorized and tagged around me, doing. Bookmark the permalink.